Shame on Yellowstone! 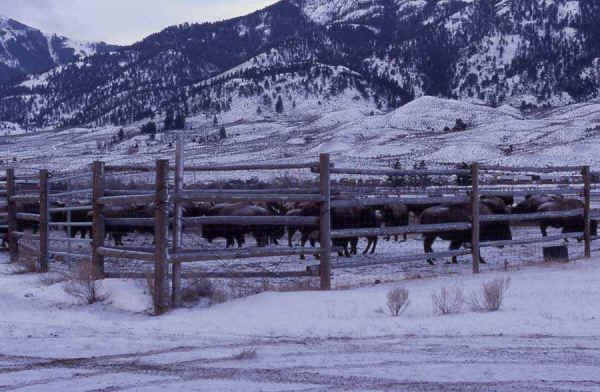 Wild buffalo confined in pens at Stephens Creek trap, inside Yellowstone National Park. NPS file photo. Hazing operations have been taking place nearly every day along migration routes north of Yellowstone. Early Tuesday afternoon, Yellowstone National Park and the Montana Department of Livestock began capturing wild buffalo at the Stephens Creek buffalo trap, inside Yellowstone National Park, for the ill-conceived Royal Teton Ranch (RTR) land scheme, which BFC refers to as the Corridor to Nowhere. The RTR land scheme is a $3.3 million agreement between the Church Universal & Triumphant (CUT), Yellowstone National Park, Montana Fish, Wildlife & Parks, the Greater Yellowstone Coalition, and the National Parks Conservation Association. CUT has been given private and taxpayer money in exchange for removing their cattle for only 30 years and allowing just twenty-five bison temporary access to small portions of public lands on Gallatin National Forest and CUT lands. BFC patrols in Gardiner report that a total of thirty-one buffalo have so far been captured. Yellowstone intends to capture between 60 and 80 buffalo for their experiment. The $3.3 million RTR land scheme - paid for with public and private money - is falsely described as a step towards "increased tolerance" for wild buffalo in Montana. It is utterly incongruous to say that this experiment holds any benefit for wild buffalo, it is simply one more way that Yellowstone, Montana and certain conservation groups compromise the wild integrity of America's last wild bison by managing them as livestock. The buffalo hazed into the trap will be held in confinement for an unknown period of time, placing them under a great deal of stress and, based upon similar operations in the past, causing serious injury and even death to some of the captured animals. Family groups will be separated, mothers from calves, brothers from sisters. They will then suffer squeeze chutes, blood tests, and highly invasive pregnancy tests. Yellowstone and Montana will randomly choose twenty-five buffalo from this test group that have blood-tested negative for exposure to brucellosis, and then further torment them by forcing them to wear ear tags, radio collars, and - for pregnant females - vaginal telemetry devices. These twenty-five buffalo will then be pushed through a small Corridor to Nowhere, encompassing less than 2,800 acres, surrounded by electric fencing and cattle guards, where they will be expected to stay until spring before they are eventually hazed back into Yellowstone. For nearly six weeks, this family group had found safe refuge in the no-hunting area of Yellowstone Village, a buffalo-friendly neighborhood, until they were chased out by hunters, who killed three. More buffalo have been killed by hunters just outside of Yellowstone National Park, raising this winter's death toll to forty-six. A family group buffalo that had been living safely inside the buffalo-friendly private lands of Yellowstone Village, where no hunting is allowed, were pushed off of private property by a Confederated Salish-Kootenai hunting party. They were chased by the hunters with snowmobiles and on foot onto Gallatin National Forest land, and three of them - two adult cows and a young bull - were shot. Consequently, two calves were orphaned, and after the incident, one of the calves, lost and confused, was later struck by a vehicle and killed. 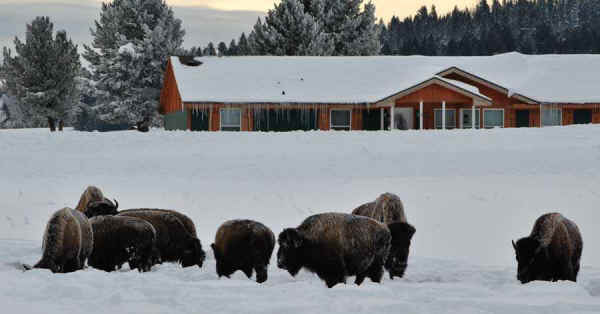 These buffalo had found a safe haven in Yellowstone Village, and had been there for more than six weeks, but the refuge they had during the hunt was violated. Local residents and BFC have been deeply heartbroken and disturbed by this tragic event. We contacted Tribal officials, who were likewise very upset to hear this news and have opened an investigation. We are working together with the Tribe to make sure that such incidents do not happen again.